Emphasis on training with relaxed flowing movements, and not hard full strength techniques in the air just to demonstrate power. The system of Ki Sei Do Kai believes that to constantly throw full force energy at nothing, is ultimately destructive. Physics dictate that energy must go somewhere, with no target to absorb this energy, it must ultimately return in the form of jarring to one's own body, long term, the effects being a deterioration of one's health. Teaching an understanding of the principles of Ki at all levels, making students understand Ki is a real force, however it is in no way mystical, it is simply unification of mind and body. The result being ultimately, concentrated power with relative ease. Positive Transfer - Techniques and kata that relate directly to fighting application. Techniques must be realistic in the street. Using open handed hit / stun techniques for striking with maximum speed. Using follow through techniques for developing maximum power. A blocking system which is not bone on bone but deflective so as to re-direct the opponents energy with minimal effort. Teaching a system of throws and takedowns that is both realistic and effective. Throws and Takedowns are included into Ki Sei Do Kai kata. How We Train is How We Will React - Emphasis on realistic interaction drills starting from the beginner grades up to advanced levels, the end result being an instant reaction to an attack. Sparring is not a realistic self defence situation, rather it is a drill bound by rules. The emphasis should be, not to think, but react and end the conflict quickly and effectively with minimal effort. Utilising impact training for positive feedback of power and for aerobic fitness, using lightweight bags and hand held focus pads, working on explosive movement, full speed, extending ones own Ki into the target. Teaching footwork and angular defence and attack. The system must be effective in 4 ranges. Kicking range, punching, striking range, grappling range and ground work. Realising that everyone is different and to develop each person to their full potential regardless of age and somatotype. The system is designed to be open ended ie. 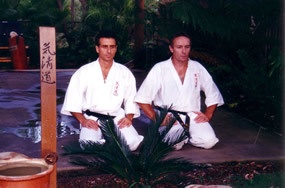 at higher Dan levels (3rd Dan and above) students will seek knowledge outside of the system and present it as a thesis. Developing a time efficient grading system with interaction between instructors and students to make it a learning experience. Certificates will be presented the same night. Higher grade students will gain experience on the grading panel under supervision of the instructors. The system maintains an oriental philosophy, utilising Japanese Dojo terminology, reflecting our respect for the concepts embodied in the Japanese fighting arts. Teaching a philosophy of humility, discipline and respect for all living things.